The Marianne Series consist of six books by our Juliette Benzoni and were published between 1969 and 1974 by Editions Trévise in France. They had also a huge success in the English speaking world. 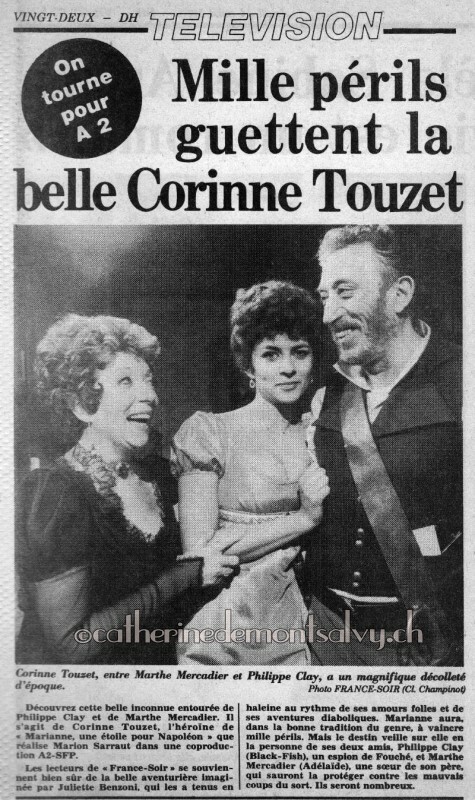 The books were the subject of an adaptation for a television series which was broadcasted in 1983 with the beautiful Corinne Touzet. She was the chosen young woman to play the heroine Marianne d'Asselnat. These last couple of years I was able to collect some rare documents (photos, articles...) thanks to my dear friends Juliette Benzoni ( the author) Marion Sarraut (the producer of the television series) Gérard Chambre (who played Jason Beaufort, Xaintrailles and Admiral John Paul Jones) and Frédérique. Some of the material I was able to buy myself on Ebay. Juliette Benzoni and her new book « Marianne, and the masked Prince ». 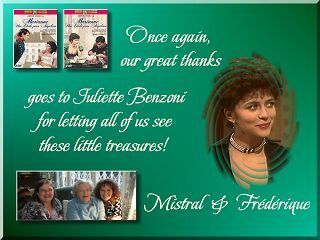 It is more than year ago that our beloved author Juliette has left us. Today I like to share with you a photo showing Juliette back in 1971. 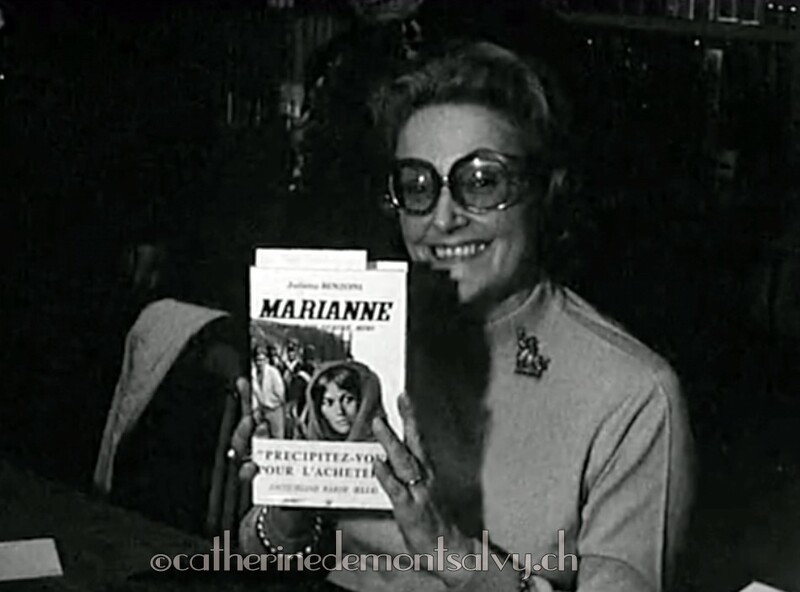 She is signing her at that time new book Marianne and the masked Prince. Was she not a fascinating glamorous Lady ? 1971 Juliette holds up the third of the Series Marianne, and the Privateer. It is a Editions Trévise copy and the original title had been : Marianne, Jason des quatre mers. The above Novel was also published in the newspaper France-Soir as a Cliffhanger, something which was very popular at that time. 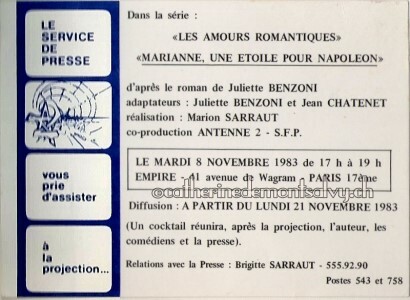 Marianne, Jason des quatre mers, the original title of the third book in France. 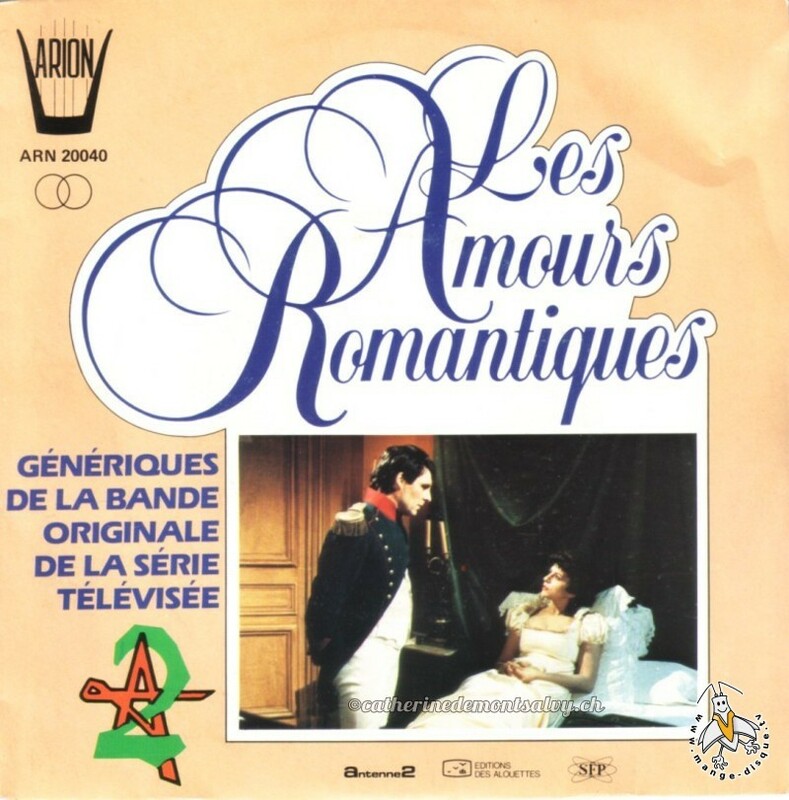 The Romantic loves was in 1983 a new television Series in France, which consisted of 60 episodes and 26 minutes long, It was broadcasted every day at 13.30 The first afternoon soap opera. It was the first of its kind and directed by the already acclaimed director Marion Sarraut. 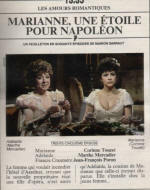 Marianne, a star for Napoleon was the first of Juliette Benzoni's Book Series to be seen on television and directed by the ingenious Marion Sarraut. 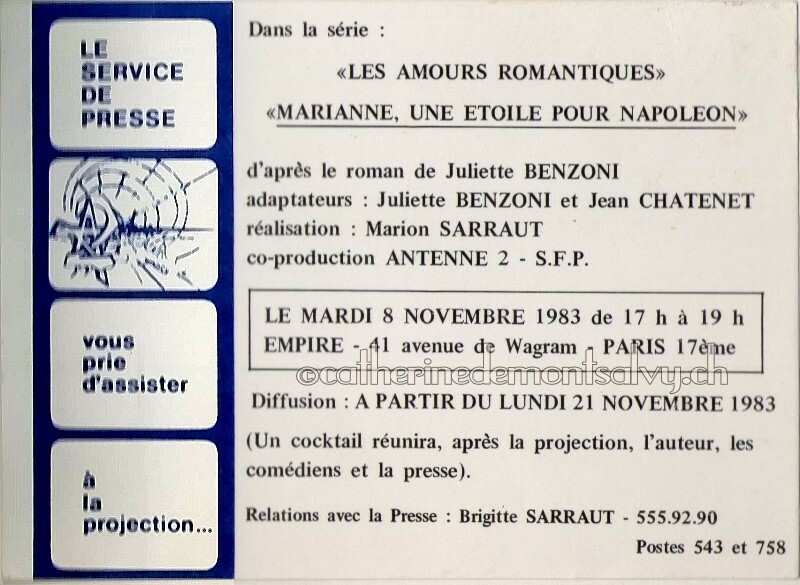 What we see here is Juliette Benzoni's personal invitation card on the day Marianne was introduced to the Media on 8 Novembre 1983 ! 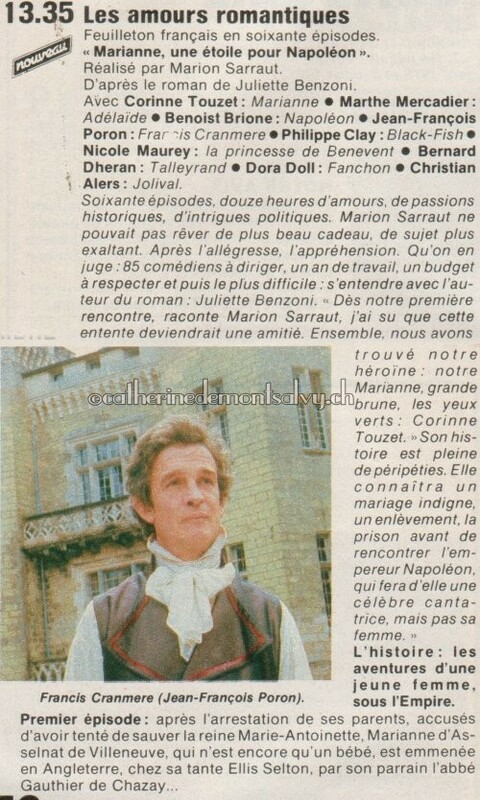 Thanks to Gérard Chambre who played Jason Beaufort, Marianne's great love, we know what information the Press were given about this brand new Series. 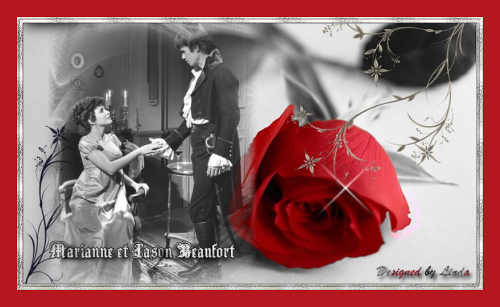 I like to add here for those who read the Marianne books, in the television Series there is a happy end between Marianne and Jason Beaufort. Further down are the documents Gérard kindly shared with me. The Guests of the Premiere were Juliette Benzoni, Marion Sarraut the actors and the Press. 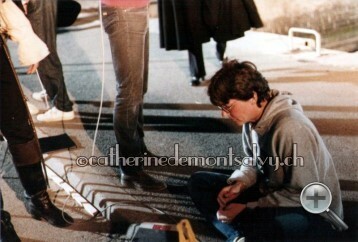 How wonderful of Juliette to share this souvenir with us so we can get an idea how things were done back at that time. We can read on the invitation that after the presentation everyone was invited to stay for a Cocktail ! 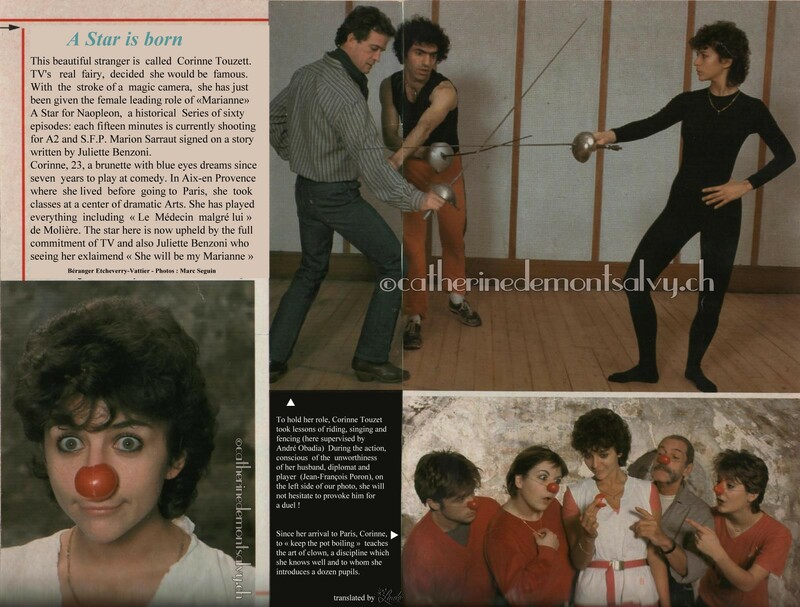 For Catherine fans, this is a very interesting document! 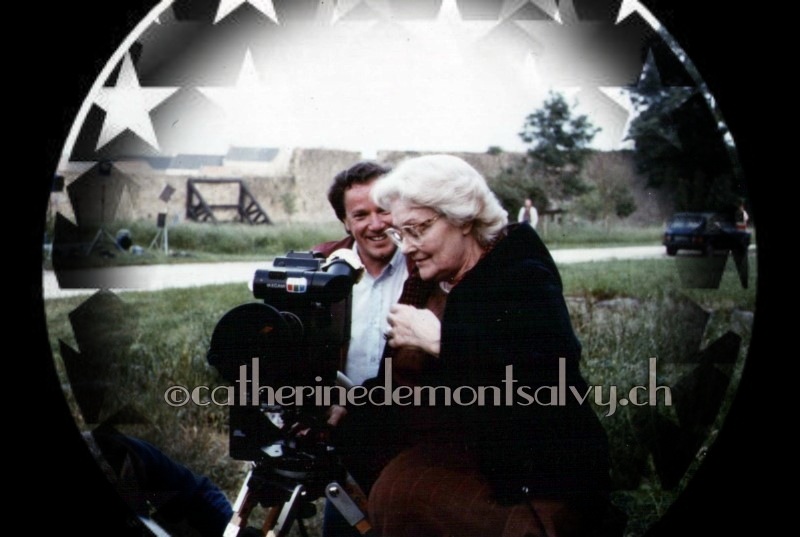 During the shooting of Marianne, Marion Sarraut the director, already searched " a young beautiful girl between 18 - 25 to play Catherine de Montsalvy. This article as many more you can see on my website, belonged to Juliette Benzoni she kindly shared with Frédérique, my friend in France and myself. I can never thank her enough for her generosity. 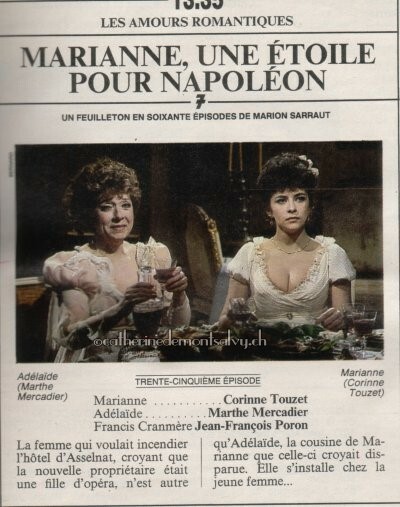 « What fascinate me about Marianne, explains Corinne Touzet is that she looks like me. She can be both feminin and determined ». 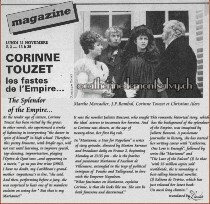 Articke Juliette Benzoni shared with us concerning Marianne, a star for Napoleon - with Corinne Touzet in the leading role. To hold her role, Corinne Touzet took lessons in riding, singing and fencing. 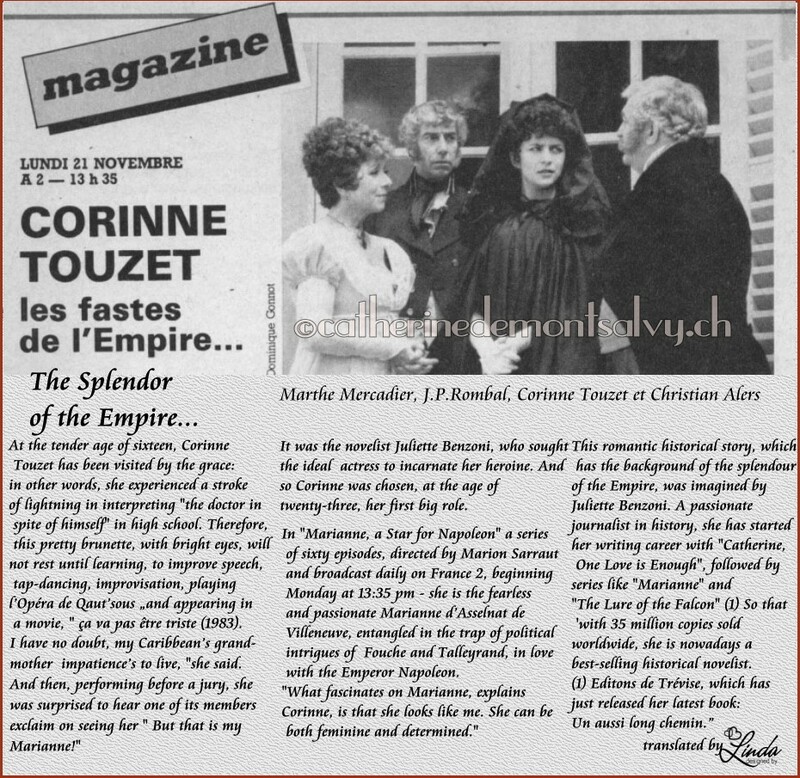 We see on this photo below Corinne Touzet (Marianne) and Jean-François Poron, (who played her aweful husband Lord Francis Cranmere). They are taking fencing lessons under the direction of André Obadia. 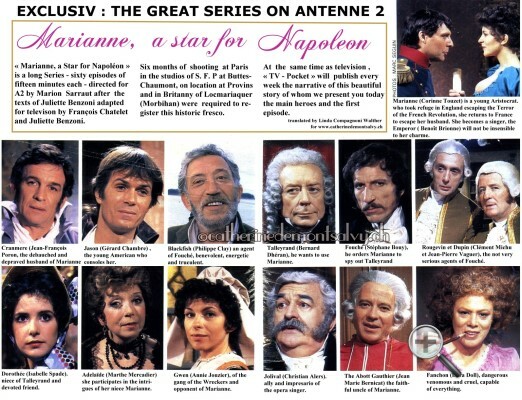 Introducing the main heroes of the long and beautiful historc fresco Marianne, a star for Napoleon. 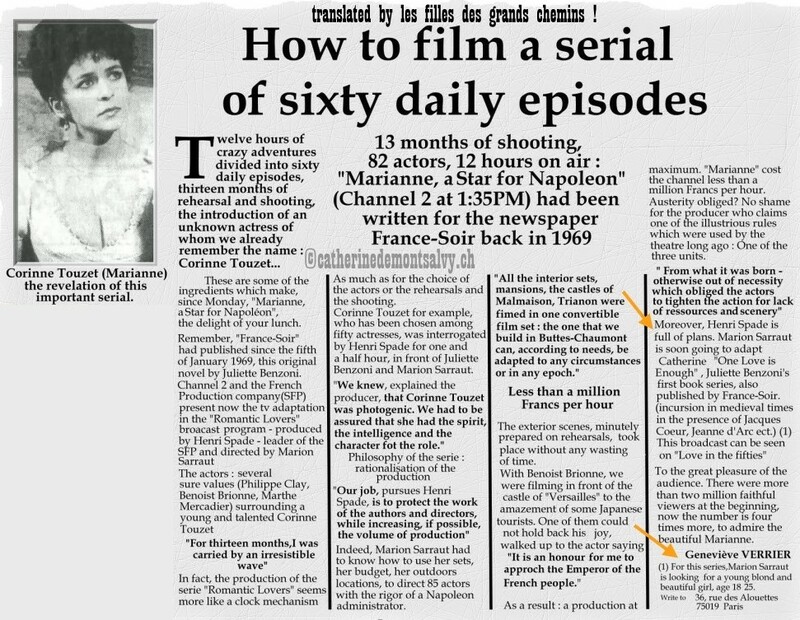 This TV-Guide reportage is a souvenir of Gérard Chambre which he shared with us and has been translated by Linda Compagnoni Walther from French to English. 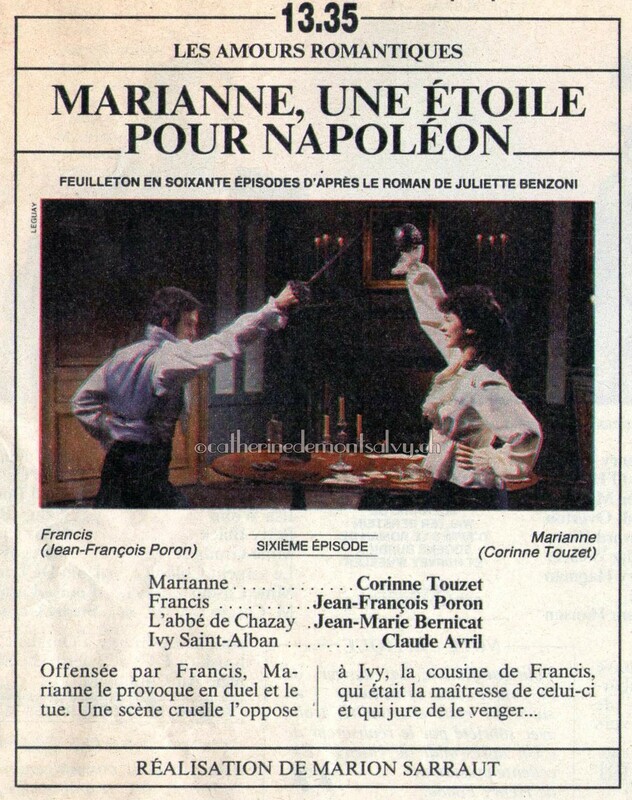 ...and this is how TV-Guide's first article's wrote about the first episodes of Marianne in November 1983. I have not translated them, they are uniqe souvenirs. These TV-Guide souvenirs have been shared with us by Juliette Benzoni, we can even see her own hand-writing on some of them. 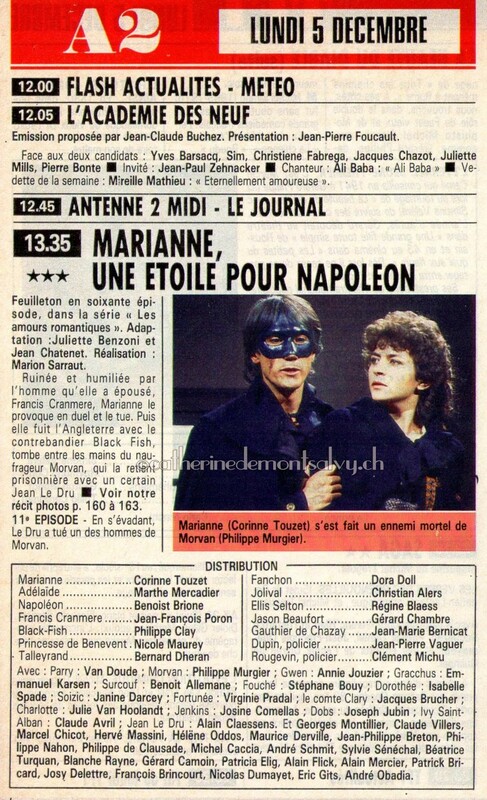 My thanks go to Gérard Chambre who shared this tv-guide annonce with us. If you click on the old-fashioned record-player below, you are able to listen to the theme. 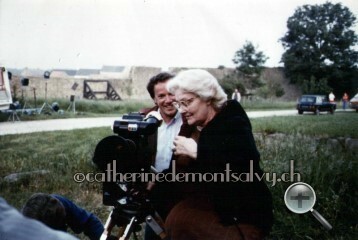 The special Slideshow with many never seen photos of the shooting of Marianne, a Star for Napoleon behind the scenes. We had the express permission of Juliette Benzoni to show these photos online. 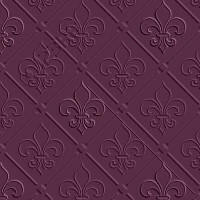 Frédérique created this beautiful slideshow. All texts on the slideshow have been written by Linda and Frédérique in 2009 in team-work. Please click here and you will come to the extra page with the Slideshow and its exklusive photos. These photos are magnificent, we see the stars behind the scene. 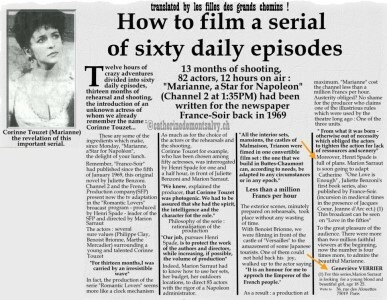 There is director Marion Sarraut at work, some still photos... Juliette Benzoni visiting the set of Marianne, a Star for Napoleon. She told us, it was one of the greatest period in her life. 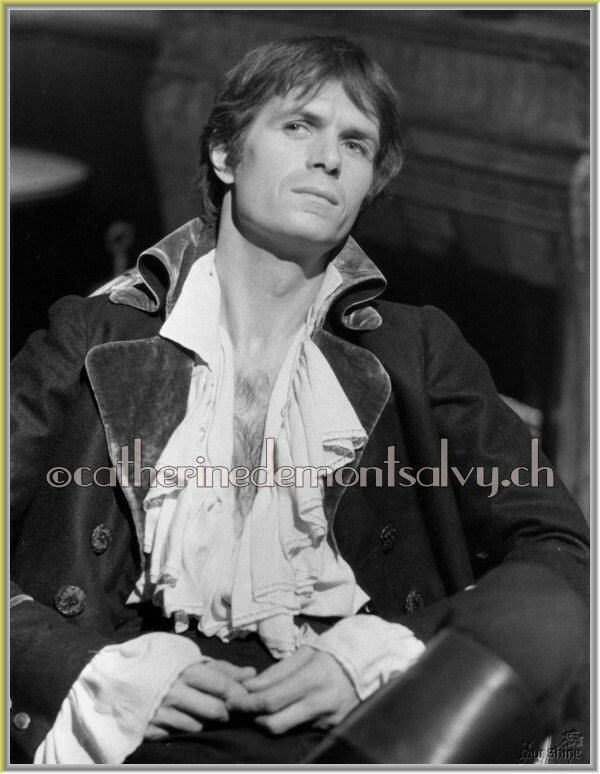 She greatly enjoyed herself as was her son Jean-François Gallois whom we see also on one of the photos.